6120 Glendalough Place, Vancouver - SOLD | Matt Pozer - Oakwyn Realty Ltd.
Roland Terry builds his masterpiece in Vancouver and I sold it. Modern architecture created in the Northwest in the post-World War II era. the mentorship of faculty member Lionel Pries. buildings. From 1942 to 1946, Terry served in the military. 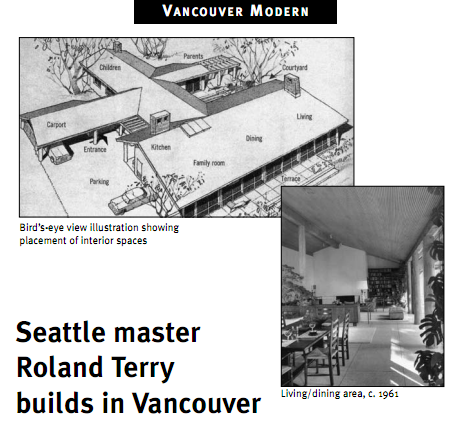 On Terry's return to Seattle, he joined University of Washington classmates Bert A.
materials, and began to emerge as leaders in Northwest regional Modern architecture. In 1952, Terry joined Philip A. Moore to form Terry & Moore, a new firm based in Seattle. the AIA Seattle Chapter Medal in 1991, the highest award given by the chapter. died on June 8, 2006.